Coffee and a Book Chick: The Sunday Salon: Do You Have an Hours Limit for Audio Books? The Sunday Salon: Do You Have an Hours Limit for Audio Books? I was recently perusing choices on my Audible.com library and found that I'm pretty consistent with the total audio time for books I select. Most of what I pick runs at about 11 hours, versus the audio time of the books in my wish list, that average at a minimum of 25 hours and creep upwards to 50 hours of total audio time. For some reason, I just can't download it if it's that looonnnnnng. Part of it is because I am a virtual worker so I don't have a commute time which means I only listen to an audio book when I'm running or doing errands around the house or about town. The other part of it is, well...come on! I mean, seriously, it just seems like a crazy long commitment, right? 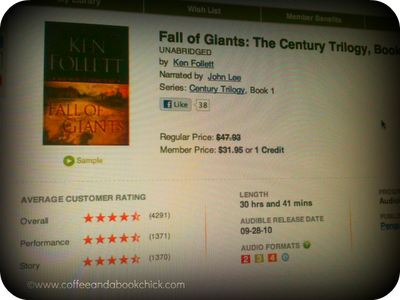 Look at Ken Follet's epic novel, Fall of Giants: 30 hours!! What?! Do you have a maximum audio time length that you won't go over? Do you have a loooongggg audio book suggestion you think that I am INSANE for not listening to because it is SO GOOD? Tell me! Okay, that's it. Looking forward to your responses! I hear ya! My audio listening happens when I walk in the mornings for an hour, so really a book like this would take me a month to finish, which does seem a little daunting, but not impossible. The longest book so far that I have listened to is 16 hours but I did it over several weeks taking breaks along the way. Long audios ARE intimidating, but long print books are worse for me. So if there is something out there, like Catherine the Great, or 11/22/63, or the Steve Jobs memoir, I know the only way I'm going to be able to read it is through audio. I even got four books into the Diana Gabaldon Outlander series on audio, with each book being between 30 and 50 discs. OMG! I did get burned out, but I do plan to return at some point. So to answer your question, no I don't have a maximum. I just have to plan ahead when I'm going to listen, to make sure I'm going to be able to dedicate the time to it. Summer vacation is the absolute worst time for audios! I usually don't check the length of an audiobook, but I'm pretty sure 16 hours or so is my max so far. Even with a commute I don't listen a lot and I only finish 1-2 books a month. The longest audio I've listened to is 11/22/63. It worked perfectly for me because I had a couple of road trips planned. I am really an AWFUL audio book listener but I keep trying it. (My first audio book was an average length and it took me over 4 MONTHS, lol!!) I have been listening to 11/22/63 forever, although I haven't actually listened in a while and that one is over 30 hours. So I will download one if I hear it's amazing but I think typically I'll have to stick to the shorter ones! No I do not, I recently listened to a book that was 14 hours long and I am not sure how long the Harry Potter books were but I listened to each of the. I don't really pay attention to the length because they all take me forever. Like you, my listening time is limited. Since I only listen while weeding or cooking, even the shortest book can be a long haul. 30 hours is LONG. Most of the audiobooks I pick are for car trips so I try to find one that matches the approximate length of the drive. Otherwise if I want to listen to it, I listen regardless. But, oh my, that is LONG! I like between 8 to 10 discs. I tend to shy away from anything longer , it just does not seem comfortable to listen to anything lthat is bigger. Ooh - interesting food for thought! I generally don't have a problem with length, but it's kind of a pain if you're not in the car or doing something for an extended period of time. Right now, I've been listening to Shadow of Night, the sequel to A Discovery of Witches, and it's incredibly awesome. It's also 24+ hours long and I'm frustrated that I am not able to listen consistently. I wouldn't let length deter me from reading a book, but it might change when I read it. My ideal: 10-12 hours long. I don't have a maximum length on a book but sometimes I'll choose based on length depending on my mood. I've listened to a few that are pretty long. Stephen King's 11/22/63 was big but the time flew by. Doomsday Book by Connie Willis was 26 hours but I wasn't crazy about the narrator so I can't recommend it, but I loved the print book which I read years ago. I'm still pretty new to audiobooks, but I think it has more to do with the narrator. When starting The Stand, I liked the idea of audiobook, but listening to an excerpt of it I knew the paper version would be better. I would also worry about the amount of details I'm missing. Most audiobooks on my list right now are between 7 hours and 15 hours, but I would love to challenge myself with a long one, one day! I typically like long audiobooks, but lately I have been listening to some short ones as well. My average is about 15 hours, but I am listening to Wolf Hall right now, and that one is 24 hours. I am also planning on listening to Shadow of Night, which is 24 hours as well, so long books are not a problem for me. I find the time to listen, as I cook and clean, and drive. But that being said, I do also enjoy shorter books. I usually stay somewhere between 9 and 11 hours too. Anything else just seems overwhelming, though I did get A Game of Thrones on audio, to go along with the reading of the book. I totallllly lean towards shorter listens. Long ones are like the physical equivalent of chunksters. I'm sure they're good, but have a hard time committing. I make exceptions but not often.